TORONTO, ON (September 27, 2017) – The Information and Privacy Commissioner (IPC) of Ontario’s De-identification Guidelines for Structured Data has won the inaugural International Conference of Data Protection and Privacy Commissioners’ (ICDPPC) award for excellence in research. 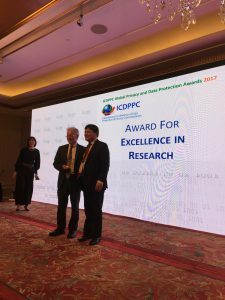 The awards attracted 90 entries from data protection and privacy authorities around the world and were announced at the 39th ICDPPC conference in Hong Kong. “De-identification” is the general term for the process of removing personal information from a record or data set. De-identification protects the privacy of individuals because once de-identified, a data set is considered to no longer contain personal information. If a data set does not contain personal information, its use or disclosure cannot violate the privacy of individuals. The IPC’s Crossing the Line: The Indiscriminate Disclosure of Attempted Suicide Information to US Border Officials via CPIC was also a finalist in the dispute resolution, enforcement and compliance category. This report and the subsequent court resolution was the result of working collaboratively with the Toronto Police Service, privacy, mental health and human rights stakeholders to develop privacy-protective measures that brought greater clarity and discipline to police disclosure practices related to information about attempted suicides collected by the Canadian Police Information Centre. The ICDPPC links 119 data protection authorities from across the globe and this year established the inaugural ICDPPC awards as a platform for authorities to share successful initiatives with each other.